MainAll NewsInside IsraelIs Germany interfering with Nationality Law? German finance minister meets with Zionist Union chairman, asking him how Nationality Law can be corrected. 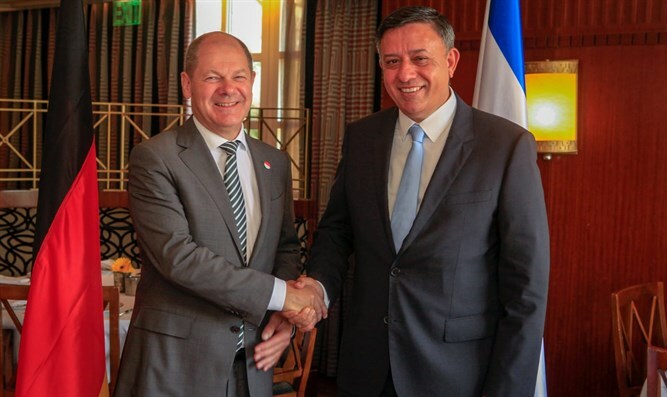 Chairman of the Zionist Union Avi Gabbay met this morning, Thursday, with German Deputy Chancellor and Finance Minister Olaf Scholz. The German minister expressed his concern over the government's moves to promote the Nationality Law, claiming that they bring to mind laws passed in China and Russia. He added that in his opinion, such laws could harm civil society and asked Gabbay to examine how the situation could be corrected. Gabbay told the German minister in response, "We will fight all the laws that harm Israeli democracy." During the meeting, initiated by Scholz and joined by MK Michal Biran (Zionist Union), the three discussed the economic sanctions imposed by the international community on Iran. As expected, Scholz expressed opposition to President Trump's handling of the Iranian threat. "We are working to prevent Iran from acquiring nuclear capabilities. I do not think that the path Trump is taking will succeed in drying out Iran." "Iran is a large and powerful country. Israel's security and the security of the region require a change in the current plan," he added.